English: I've been in love after school. Published: Jan 24, 2017 to ? Hayama Kao yearns for an existence that would make people notice her. Even in her final year of middle school when she confessed to the boy she liked for three years, he couldn't even recall her name. Now in high school, she is working as a temporary manager of her school's boys volleyball club against her will. Kao's older brother, an alumnus, currently a teacher and the advisor of the club, placed the responsibility on her shoulders to recruit Kuze Nagisa for the volleyball club if she wanted to quit being the manager. Even though silently observing someone as dazzling as Kiryuu in the club is the only redeeming thing about being the manger, Kao's body aches. She is at her limit and wants to quit being the manager. But no matter how much effort she puts on recruiting Kuze she simply cannot convince him to join. Then one day, she notices something that took her breath away. It was bluer than the sky, even bluer than the sea; it was Kuze Nagisa practicing volleyball all on his own. The blue days start from here! Story: The story of Houkago, Koishita, might seem a bit too regular at first. 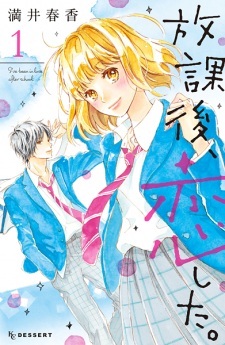 And yes, it's pretty much like all the shoujo romances, but somehow this one had something so eye-catching, that I just had to keep on reading!! There's not that much drama, moreover, it focuses on the small big things in life that matter for us. It's a story which could be true for any of us and that's what makes it so exciting. Art: For me I really like a lot this manga's art style. It's not too outstanding but keeps the cute mood going. And of course, makes the characters shine!! Characters: Such lovely characters!!! More or less just normal high school students. But wait, what is defined as normal? Exactly! No one seems too normal when gets to be picked as main characters. However, they might not be characters, but the feelings, you remember after reading the manga. Enjoyment: As to say, I myself, have really come to like the mood of Houkago, Koishita. It's a really beautiful story, which doesn't rush things too much. And that way it keeps the readers wanting to read more and more! I really enjoy reading this since it's just something so amazing, gives of the feeling of being in love, to put it simply. Shortly said: This is shoujo romance at it's best.